Starting build 007 of TKaraokePro2, TKaraokePro2 can play TKB songs that come with TKaraokeUSB bundles. Depending on the bundle you purchased, the song count ranges from 40000 to 60000 songs. 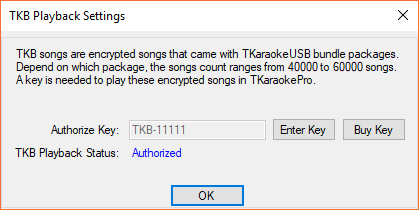 You are free to copy these TKB songs from the hard drive that came with TKaraokeUSB hard drive and play them on your computer using TKaraokePro2. To enable playback of TKB songs, you will need an authorized TKB Key. You can buy the key here. If you show proof of purchase of the TKaraokeUSB bundle or Replacement Hard Drive, you'll get a 50% off coupon. In TKaraokePro2, go to Options => TKB Playback Settings. Then click on Enter Key and enter your TKB Key. Then click on the Authorize button. You will only have to do this once and it will remember your settings. Note that if you haven't authorize TKB Playback, playing any TKB song will skip over and generate a log entry that indicate TKB Playback isn't authorized yet. I entered the code to authorize tkb playback but got an error message saying invalid code. Already emailed tkaraoke.staff@gmail.com the error screen shot. My pro version 2 is Nov 5. Anything else I can try? Make sure your computer has connection to the Internet. I was able to get authorized. The PC was connected to wire internet. Previously the wifi got choppy so I couldn't register. 1 user thanked cobr for this useful post.